Scroll down to hear Duke. 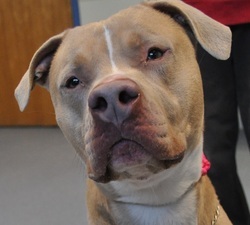 Duke landed in a municipal pound on Long Island after he was devocalized. Though he was only three years old and very affectionate, no one wanted him. Duke started regressing after spending nearly a year in a cage. The shelter would have had no option but to euthanize him if his volunteer walker--a pet sitter with a huge heart--hadn't adopted him despite his disturbing voice. "Some people say he sounds like a seal, others, like he has hiccups," according to his adopter, Dawn. "Everyone wants to know what's wrong with him. My mother cries when she hears his voice." Smart and eager to please, Duke was easy to train, Dawn says. "It wasn't long before he learned to sit, stay, come and to stop barking on command." "So why didn't his first owner do that instead of making him endure such a cruel surgery?" That is a question all adopters of devocalized animals ask. Copyright 2013 Coalition to Protect and Rescue Pets. All Rights Reserved.